So how powerful is it to use the word "diffractor(s)" when listing your 1998 Tek? It makes a big difference - you can't rely on buyers to recognize that it is a Diffractor or not. The best example I have is to do a search of ended listings for "diffractors." You only get 7 results, but only three of those 7 are actual diffractors. 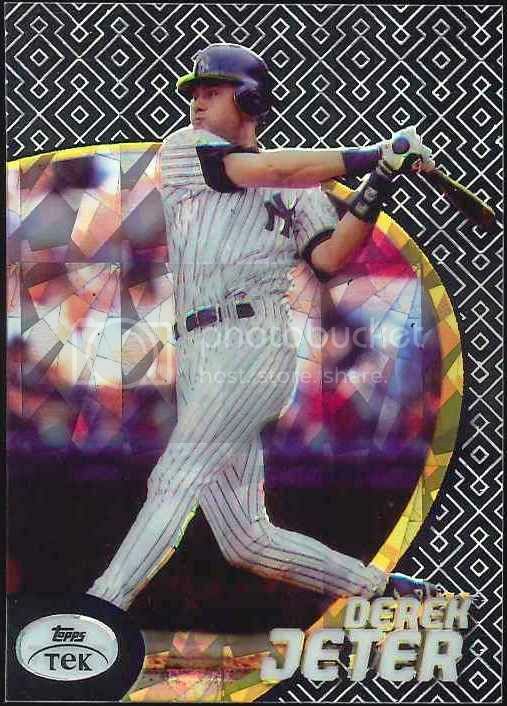 People ponied up $19.50, $15, and $10 for non-diffractors of Bonds, Chipper, and Pudge simply because the listing claimed the cards were Diffractors. Another interesting example was when a slew of individual Edgar Martinez listings hit just over a month ago (no longer in ended listings). Mixed in there was one Diffractor not listed as a Diffractor. It was a great scan and it was so obvious that it was a Diffractor that I didn't even bother bidding. I assumed it would go for around $20. I was wrong. I only went for $9 while some base went for even more! Flash forward to an auction ending today of an Edgar Martinez that IS listed as a Diffractor, and it's already up to $16. So even collectors that are educated enough to know that they want Diffractors and that they should go for a premium are not educated enough to recognize the difference between Diffractors and base. No offense if it was a board member, but this looks like an awful deal. Only four packs (16 cards) for $18.50. Considering Diffractors are 1:6, this looks like some pretty bad odds. That may be a better price-per-pack deal than those that paid $160 for a box, but at least in a box you're pretty much guaranteed 4 Diffractors. I would have bought those 4 packs for that, no question. Even if you don't get a Diffractor, you might pull one or two base cards that a few set/player collectors are desperate for. It's not unreasonable to get $20 for a base card, that could pay for your packs right there. It's really quite rare to be able to get $20 for a base card. The stars kinda have to align. It's gotta be of the right player and it's gotta be a card that two player collectors are going for at the same time. 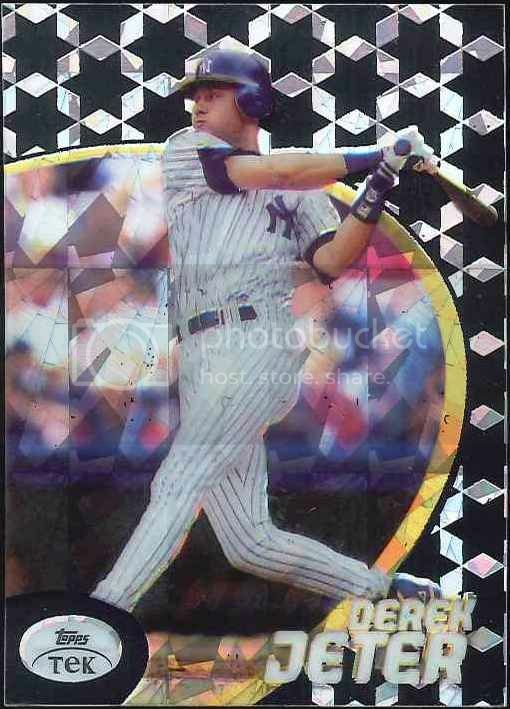 The only two in ended listings are that Jeter I listed and a Ripken that sold for a $19.99 BIN. 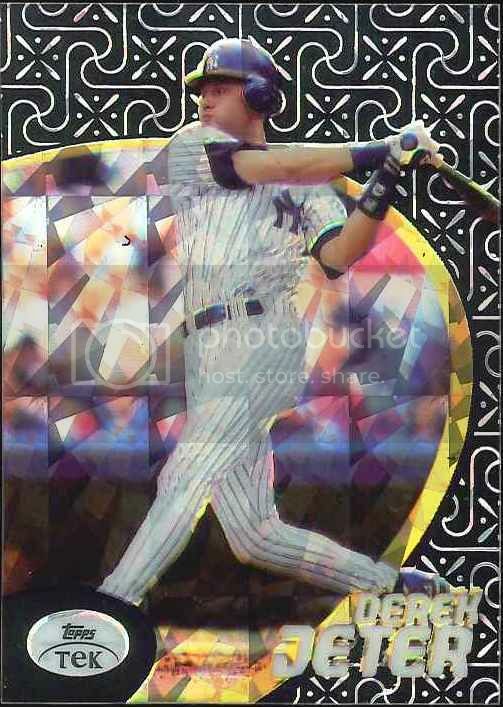 Not all Jeters will sell for even $10 - it just happened to be that one particular that sold for $24. Same with Edgars. When I first realized his base was going for $5 a pop, just about any pattern you threw out there would get the $5-$6. Now, the two or more guys that were fighting over them have fewer holes in their collection. Some go for just 99 cents now. There are 21 players I collect in the 1998 Tek checklist. That's 1890 base and 1890 Diffractors I need to have a complete PC set. Right now, I think I have maybe 35-40 base and 0 Diffractors. Ouch. I am curious as to why Ryno didn't make the set. In a way I'm glad, but in a way it would have been a fun hunt. Now that we have 14 years to reflect on this release, we have the ability to Monday morning quarterback Topps for the decisions they made about what players they included and excluded. I don't really blame Topps. At the time (and really still to this day) there was a lot of pressure from collectors to include the hot prospects. This meant that some pretty popular players had to be excluded. Actually, with how long and strong the Nomo craze lasted, would there be any unopened Tek left? But seriously, instead of $160 a box, how much would this product be going for now?! Cliff Lee in 1998 Tek? Can I have some of what you're smoking? I have around 15-20 different patterns of Schilling. I need to get around to selling them. Oops - must be Carlos Lee! After picking up my first Derek Jeter Diffractor (thanks to a poor listing) after having not even seen one go at auction since I've been paying attention, I found two more. Pattern 45 - I'll call this pattern Mitsubishi since it's got the Mitsubishi logo repeated over and over. Pattern 3 - I can't think of a good name for this one. I paid a ridiculous $60 for this one, but since it came in a lot of cards I figured I could resell the rest of the lot and make some of my money back. I think this is the first Ripken I've seen since I've been paying attention. And a PSA 10, no less. Pattern 55 - Maybe the most "filled in" pattern of them all. Almost all white. I have a smattering of these through some trades. PM me if you need anything.